Here’s an super-condensed round-up of the cool stuff from E3 this year. First up, the presentation that’s undeniably caused the biggest buzz: Microsoft’s Project Natal, a motion sensing device that allows you to interact with your Xbox 360 using gestures and voice without the need for a controller. Peter Moyneux presented a scripted prototype of an interaction between an on-screen boy, Milo, and a real-life player. It’ll be interesting to see how and if this will actually work in the real world with real games. It has no announced release date but is expected to be released in late 2010. Nintendo presented their Wii MotionPlus which plugs into the Wii Remote to add greater motion sensitivity which will be used in games such as Wii Sports Resort, as well as their Vitality Sensor. Sony, too, demonstrated their version of a motion controller which tracks the location of two “wands” — this will be available in Spring 2010. E3 certainly wasn’t short on cool games either. 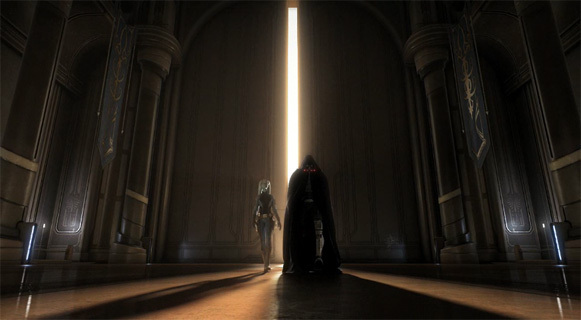 LucasArts showed an impressive first cinematic teaser trailer for the forthcoming Star Wars PC MMO, The Old Republic. They also announced the return of Monkey Island on both Xbox and PC in the form of an enhanced Special Edition version of the classic Secret of Monkey Island as well as reveal that Telltale Games, the guys behind the new Sam & Max games, are working Tales of Monkey Island, a brand new episodic game. Nintendo didn’t announce, as many were expecting, a new Wii-based Zelda game but did reveal that Mario would be back in New Super Mario Bros Wii. Valve announced a sequel to the co-operative zombie shooter Left for Dead for Xbox 360 and PC and presented an hilariously over the top gameplay trailer. Also delightfully over the top was the opening cinematic for Harmonix’ The Beatles Rock Band, directed by Pete Candeland. BioWare showed their new trailer for Mass Effect 2, the eagerly awaited space RPG for Xbox 360 and PC. Sony showed new trailers for Final Fantasy XIII and Heavy Rain and announced that God of War III would be released in March next year. They also announced Agent, a new “espionage action game” from Rockstar North, the team who brought us Grand Theft Auto. We also got a more polished look at The Last Guardian, the fortcoming game from Team Ico who brought us Ico and Shadow of the Colossus for the PS2. You may remember the leaked Project Trico trailer a few months go — this is the same game. Finally, a superb looking little game for the DS caught my attention called Scribblenauts. It’s a side-scrolling platform-ish puzzle game where the player summons objects to solve problems by writing the name of the object you want on the screen with the stylus. Scribblenauts will be released late this year but here’s a video of the folks from nintendorks.com having a play with it.